Drawing is now closed – winner to be announced October 7, 2014! 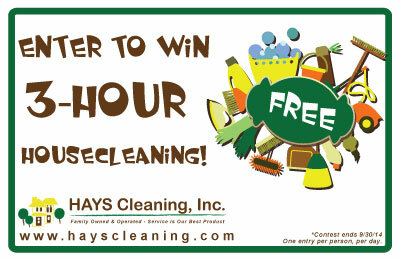 Enter here to win 3 free hours of housecleaning! Limit one entry, per person, per day. Homes located more than 10 miles from HAYS Cleaning may require additional hours purchase to make travel cost effective. May not be applied to previously provided services. Must enter online by completing the form above. Comments left on this page do not count as entries. active servicemen and parents of Veterans or servicemen. complimentary cleaning. Limit one complimentary cleaning per household. 708-598-3819 or emailing mary@hayscleaning.com by November 30, 2013.
memo area. Checks may be mailed to HAYS Cleaning. 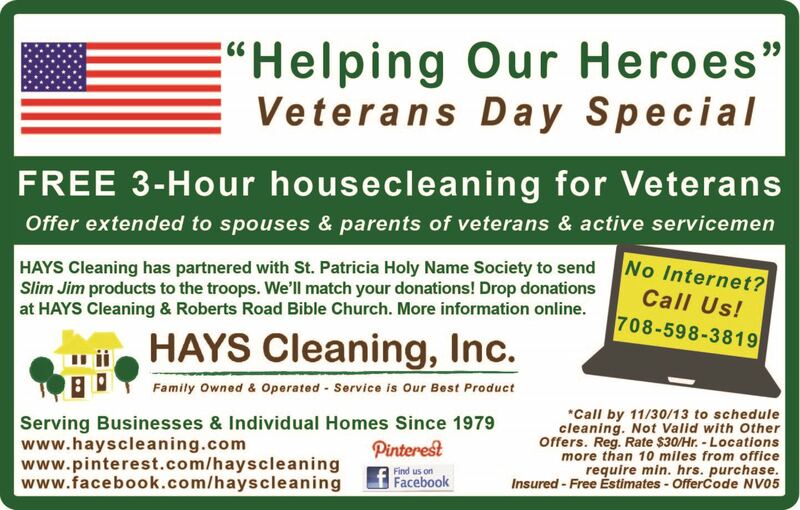 sponsored by HAYS Cleaning, at http://www.helping-our-heroes.com. Roberts Road Bible Church is a “Light House,” located at 8419 S.
church, please call 708-598-2330 or visit http://www.rrbchurch.org. people at HAYS Cleaning strive to make a difference, not just do a job! October 19, 2013 is Sweetest Day! 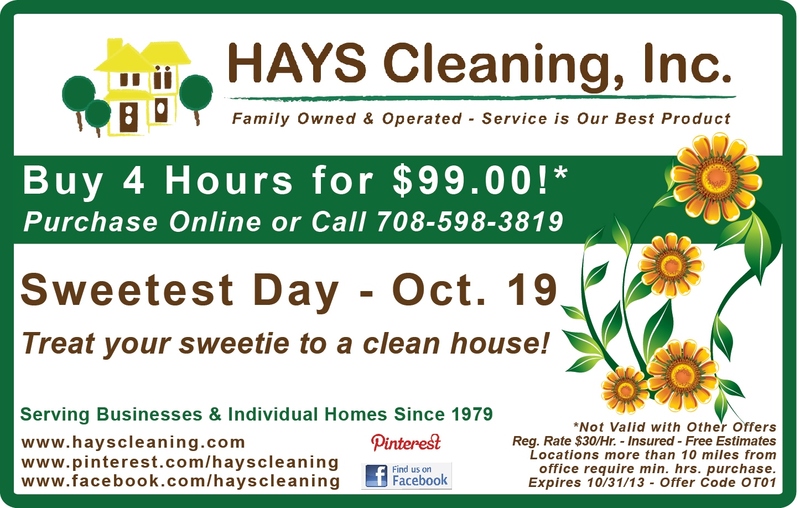 Treat your sweetie to a clean house! You may purchase online using the link below, or mention the coupon when scheduling your cleaning by calling 708-598-3819 or emailing mary@hayscleaning.com. Additional hours billed at $30 per hour. Click here to purchase. Offer valid through October 31, 2013. 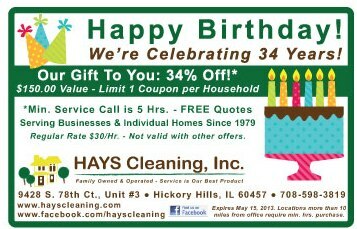 It’s our 34th Birthday, but our customers are receiving the gift: 34% off your next cleaning (minimum service call 5 hours, please). Call 708-598-3819 or send us an email to schedule your next visit!